Escape means attacking Elusion from within the program. It’s dangerous and it’s a puzzle. And even if they manage it, how will they be able to stop Orexis from distributing Elusion to the masses when the people who run it are corrupt? Etherworld was satisfying in that this was not book two of a three book series, and this made me so happy, mostly because as the story was unfolding I couldn’t figure out how it would possibly end in a way to need an additional novel. I love the virtual reality/Matrix like feel of the entire series. 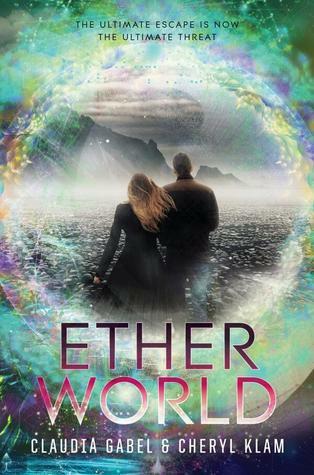 Etherworld picked up practically where Elusion left off, and moves pretty quickly through the story; at no point did I feel like it was just dragging on. This book is even less focused on the romance than Elusion was, and the main focus was mostly about getting everyone to safety and bringing the truth to light, but that doesn’t mean that Regan and Josh don’t get a few precious moments together. My only problem with Etherworld was that as facts unfolded I was a little lost as to the motives behind some of the decisions the characters were making (I’m purposefully being vague to avoid spoilers), and because of that the story did feel a little bit forced. Otherwise, this is a great scifi/dystopian-like series.